SHIMLA, India — The people of Shimla haven’t agreed on much lately. A drought in the Himalayan resort has had residents blaming farmers, the tourism industry and one another for depleting the strained water supplies. And everyone’s been angry at the key men. Shimla’s decrepit network of water pipes, built under British colonial rule more than 70 years ago, depends on the civil servants known as key men to open and close the valves that supply each neighborhood. The current shortage, which in May left some homes without water for 20 days, has led to such fury toward the key men — accused, in just about every neighborhood, of depriving it of its fair share — that a court ordered police protection for them. THE GREAT GAME IN THE INDIAN OCEAN: STRATEGIC PARTNERSHIP OPPORTUNITIES FOR THE U.S. There is a growing strategic competition underway in the Indian Ocean and Arabian Sea between India and China focused on acquiring commercial ports and military facilities. It is a race for strategic access, leverage, and influence for energy resources, markets, and national security. 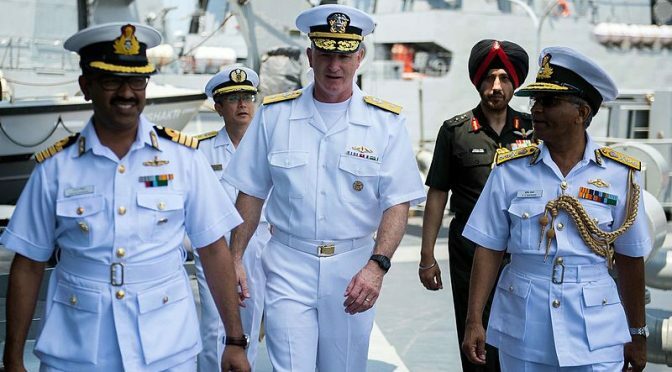 This competition between two relative new naval powers in the region will directly influence the U.S. and its regional partners in the U.S. Central Command (USCENTCOM) and U.S. Africa Command (USAFRICOM) Area of Responsibilities (AORs), beyond the usual purview of Pacific Command (USPACOM) whose AOR India lies within. For the U.S., this represents a strategic opportunity to compete against China’s growing influence by expanding its relationship with India in the CENTCOM and AFRICOM AORs. Most Afghans want peace but progress in achieving that has been blocked by the drug gangs, Pakistan and some troublesome traditions. Achieving peace requires all the help it can get and most Afghans understand that. For example, on June 4th the Afghan Ulema Council (the top religious authority in the country) met in Kabul. The 2,000 Islamic scholars and senior clerics rarely hold such large meetings but this one was considered urgent because of the continued damage being done by the drug gangs, their Taliban hired guns and the Pakistani support for all this. So the Council issued a fatwah (religious ruling) condemning suicide attacks and supporting peace talks. The council also called for a ceasefire. If nothing further is done, the U.S.-China trade deal reached this month will be remembered, to quote a phrase coined by the current president of the United States, as "the single worst trade deal" ever negotiated. Instead of tackling Chinese industrial policy practices that have distorted many sectors of the global economy, Donald Trump has enthusiastically embraced a quick fix that economist Brad Setser, of the Council for Foreign Relations, has called nothing more than "a commitment on China's part to buy more of the things that it likely would buy more of no matter what: agricultural products and energy." The Trump-Kim Summit was not just about the USA and North Korea. China was in the thick of things. When the recent thaw in relations between North and South Korea was first announced, China was not in the picture. In fact, some countries in the region had been uneasy about the pace with which the new found detente was progressing. However, after the conclusion of the summit, it is quite evident that one of the clear winners has been China. Despite its absence in Singapore, China has now positioned itself as one of the key stakeholders in the talks, and reaffirmed the need for countries in the region to engage with it more as these talks progress. The West sees China as a threat, as do China’s neighbors. What bothers many non-Chinese is what exactly are the Chinese up to. China doesn’t really need all the territory they are laying claim to. What does China need with the South China Sea, large chunks of India and, rather quietly, the Far Eastern Russian territories. These adjacent land areas can be seen as the traditional Chinese way of expanding but China has tended, for thousands of year, trying to absorb areas not populated by Han (ethnic Chinese) people. While the traditional “Chinese lands” are now incorporated into communist China what, the question is, to the Chinese want and why? LONDON — Only a few months ago, the global economy appeared to be humming, with all major nations growing in unison. Now, the world’s fortunes are imperiled by an unfolding trade war. As the Trump administration imposes tariffs on allies and rivals alike, provoking broad retaliation, global commerce is suffering disruption, flashing signs of strains that could hamper economic growth. The latest escalation came on Friday, when President Trump announced fresh tariffs on $50 billion in Chinese goods, prompting swift retribution from Beijing. The vision of a world without nuclear weapons is history. In its annual report, the Stockholm International Peace Research Institute has criticized the ongoing development of new nuclear weapons. Last year was a special year for those in favor of nuclear disarmament. A total of 122 UN member states signed a pledge not to produce or possess nuclear weapons.However, this has not brought the goal of a nuclear-free world much closer. According to the latest estimates by the Stockholm International Peace Research Institute (SIPRI), 14,465 nuclear weapons still exist, in the hands of just nine states: the US, Russia, Britain, France, China, India, Pakistan, Israel and North Korea. Although internationally these nine countries are in the minority, they have absolutely no intention of giving up their nuclear weapons. Many high-level meetings of security experts and officials in Israel have tried over the past few weeks to come up with policy directives regarding the future of Gaza. This is a positive development, especially because over the past 11 years there has not been a serious review of Israel’s strategic goals in Gaza. Even after three wars with Gaza, the Israeli policy has been to leave a weakened Hamas in power. When the policy of “isolation” (bidul in Hebrew) of Gaza began – after the Hamas coup d’etat against the Palestinian Authority in June 2007 – the basic idea was to advance the peace process in the West Bank and its economic development while closing off Gaza, so that Palestinians could easily see the difference between the two regimes, their interaction and openness to Israel and to the world. Those were the days when Dr. Salam Fayyad was prime minister in Ramallah. Though he was the “darling of the United States and the West” whom some Israelis called “the Palestinian Ben-Gurion,” prosperity and peace did not appear. Siegfried Hecker talks about his first-hand interactions with North Korean nuclear scientists, what went wrong in past dealings with Kim dynasty, and the best possible outcome of the Trump/Kim summit, in a 27-minute conversation with Lynn Eden of the Bulletin of the Atomic Scientists’ Science and Security Board. North Korea is a bizarre country that almost seems frozen in time -- a bizarre, frozen-in-time, armed-to-the-teeth, crazy-dangerous country. We take a deep look at the early cyberwar efforts of an increasingly aggressive cyberwar player. Today's security threats have expanded in scope and seriousness. There can now be millions -- or even billions -- of dollars at risk when information security isn't handled properly. Author's note: This article was originally published in Counterterrorism Magazine in 2012, reprinted here with permission. Although Kim Jung-Un's leadership has solidified since that time, our knowledge of the rogue nation's cyberwar operations remain quite similar to what was explored in this briefing, except that, if anything, Kim Jung-Un's cyber efforts have increased dramatically. This week, we've heard a lot about what was discussed at the summit between President Trump and North Korean leader Kim Jong Un - nuclear weapons, military exercises, returning the remains of U.S. troops killed in the Korean War. As David Sanger filed his stories from Singapore, he noticed something very big missing. Sanger is a national security correspondent for The New York Times whose new book is all about cyberweapons. DAVID SANGER: Cyber is not included in any of these discussions with North Korea. They want to do nuclear, bio, chem. And yet cyber is the only weapon that they've actually used against us and used effectively. The 2008-09 financial crisis was a warning Washington has not heeded. We have continued in our profligate ways, increasing our federal deficit and national debt. Far from bringing back Glass-Steagal and adding new measures to keep banks from pursuing risky business, we have de-regulated them while offering new incentives for moral hazard. Seemingly secure in the knowledge they can buy enough Members of Congress to privatize profits while socializing losses, banks and other financial companies are doing everything that brought on the previous crisis. The party is still roaring, the champagne is flowing, and everybody is still wearing a lampshade. But in the east, the sky is beginning to brighten. In November 2017, North Korea conducted the last of many missile tests that year, launching the powerful Hwasong-15 into Japan’s Exclusive Economic Zone. US Defense Secretary James Mattis acknowledged that this missile poses a worldwide threat and demonstrates the extent of North Korea’s progress in missile development. According to the Union of Concerned Scientists, if Japanese reports on the test missile’s trajectory are correct, they indicate that the Hwasong-15 has sufficient range to hit “any part of the continental United States.” While there is still some debate over whether North Korea has the capability to deploy a nuclear warhead on this missile, reports suggest that, according to American and Japanese intelligence assessments, Pyongyang may be able to miniaturize a warhead fit for deployment. Summits are not contests to determine winners or losers. What the U.S.-North Korea summit did was change the way the two countries manage relations — and crises — offering a respite from the heightened unease on the Korean Peninsula. In breaking past the barrier of demanding change before dialogue, the United States is in a better position to manage tensions with North Korea even if denuclearization is never completed. North Korea appears to have empowered its negotiators to make concessions without having to come back to Pyongyang, allowing for more meaningful and productive talks. What About the Decybernization of North Korea? Donald J. Trump made history with his Singapore Summit with Kim Jong-Un of North Korea, but did their promise for total denuclearization of North Korea exclude the promise for its decybernization of its electronic cyber weapons? That is a huge question to pose to the President, his diplomatic staff, and to all his critics who have no idea of what weapons we should be concerned about. It is also a question for the Mainstream Media to ponder as all their criticism seems devoid of any valid questions about this real and growing threat. Over the past eighteen months, major Western media outlets have followed every step of Facebook’s slow and painful fall from grace, including the recent Cambridge Analytica scandal. However, while the stories focus heavily on Trump and Putin, it is CCP General Secretary Xi Jinping who may benefit the most from a collective loss of faith in Western cyber systems and institutions. While the world’s attention has focused on accusations of collusion and election hacking, the Chinese leader has been promoting a homegrown PRC approach to technology, the internet, and governance, one that seeks to embed the PRC’s concept of “cyber sovereignty” (网络主权) in the institutions of global internet governance. Most of us like to think our thought and decision-making processes are based on objectivity and science, but that's not always the case. Here's why. A recent study showed, no matter your education, a good anecdote will lower your ability to think clearly. What is a TED Talk but essentially one big long anecdote? Think about it. Those are the major conclusions that can be taken from a new study by Brian Chow published in Strategic Studies Quarterly, the strategic journal of the United States Air Force. Chow is formerly a senior physical scientist for twenty-five years at the RAND Corporation and described the inevitability of space weaponization in his article “Space Arms Control: A Hybrid Approach." He argues that this will be the result of spacecraft that can remove debris and service existing satellites. These dual-use spacecraft are necessary for peaceful space activities. However, they can be quickly refashioned for military purposes—with devastating consequences. What do drunk Google searches and war have in common? They’re both chaotic, incoherent and occasionally regrettable. They are also both more effectively solved by machine learning. Modern technology has made military strategy more complicated than ever – just look at China’s recent installation of cruise missiles on its artificial islands in the South China Sea. It’s becoming harder and harder for humans to keep up. Far away from the “tactical edge” of soldiers and weapons, smart algorithms like Google’s RankBrain will soon be needed to analyze the mountains of data and invent new military strategies. Many of the seemingly successful mechanical planning processes of the last two centuries are now holding us back. We lack critically thinking about our methodologies; the military must incorporate reflective practices and an ability to transform processes towards a more flexible and dynamic form of sensemaking and acting in a complex reality.